A police helicopter crashed into the roof of a crowded pub in Glasgow on Friday night killing all three people on board and a further five people in the building. 14 people are in a serious condition in hospital. All those on board the helicopter, two police officers and a civilian pilot, were killed when the aircraft crashed onto the roof of the crowded Clutha pub. A further five people inside the building died and fourteen others got injured, according to Chief Constable Stephen House. "We are still in ... a rescue and recovery situation," House said. "Until the helicopter is out of the way we won't know what ... is going on underneath." In total, 32 people were taken to hospitals across Glasgow after the helicopter came down. Gordon Matheson, leader of Glasgow City Council, in a press conference on Saturday evening paid tribute to the people of Glasgow who formed a human chain after the accident to help the rescue services pull people from rubble to safety. He also thanked the city council staff who came out to help without being asked on Saturday, a day off for most workers. He said that the way people reacted to the disaster proved the city's new slogan “People make Glasgow” although the city has long been famous within the UK for its tough but kind locals. The 12-meter helicopter crashed into the pub at 22:30 on Friday. There were about 120 people in the pub at the time, and the Glasgow band Esperanza was performing a gig when the accident happened. The chopper was a Eurocopter EC135 T2, which is widely used by police forces across the UK and worldwide. It has a good safety record but in 2002, a police Eurocopter EC 135 came down in a field in Ayrshire; all three people survived. Eyewitness said the chopper fell from the sky like a stone and others have said there was a problem with the aircraft’s rotor. Investigators are still trying to work out the cause of the accident and have warned against speculation. Just after the crash, Jim Murphy, the shadow international development secretary, who was the first to report the incident on his Twitter account, told the BBC that a “pile of people” were clambering out of the Clutha Bar onto the banks of the River Clyde. 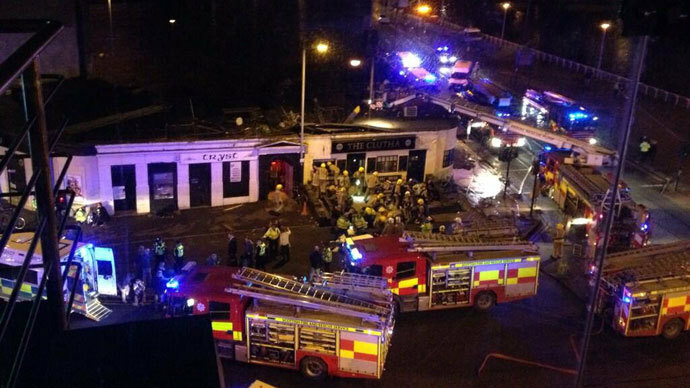 Local journalist Rebecca Gray reported that there were around 100 people inside the Clutha Bar at the moment of the accident. There were no reports of explosions or fire following the crash. A witness to the accident, which seemed to have occurred during a performance, described the roof of the Clutha Bar collapsing, with people caught under the debris with injuries and smoke filling the locale. “Still no proper updates on what has actually happened. Now being moved away from the scene. Some people still trapped and injured outside,” Wesley Shearer tweeted. Another witness, Jan Hollands, was across the road from the pub in a hotel when she heard a crash. “Scary stuff & scary scenes. Horrible,” she wrote on her twitter account shortly after the accident. Witnesses said that many people volunteered to go back into the pub after the crash to help in the rescue effort. Labour Party leader, Ed Miliband, said it was "shocking news from Glasgow. All my thoughts are with those who have been injured."